Elizabeth Wolak, MA, passed away on April 15, 2017, in Vancouver. 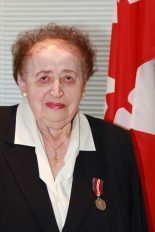 Born in Krakow, Poland, in 1923, Elizabeth, a Holocaust survivor, escaped to Soviet territory and was deported to a forced labour camp. Afterwards, Elizabeth earned an MA in English from the Jagiellonian University, and graduated from the Krakow Academy of Music in 1951. Emigrating in 1960, she focused on Jewish choral music, working in Australia as a choir director and teaching music at a Sydney high school. In 1963, she and her husband settled in Vancouver, where she earned her BC Teachers’ Certificate. She founded award-winning choral ensembles in Vancouver, produced three records, and taught piano and voice for nearly 50 years. For her choral work, Elizabeth, member of the BC Choral Federation’s Hall of Fame, was given the Amy Ferguson and Herbert Drost awards. She received the BC Community Achievement Award from the BC government and the Queen Elizabeth II Diamond Jubilee Medal. She was awarded Poland’s Siberian Cross. She is deeply missed by sons Richard and Arthur (Anna), and her three grandchildren.